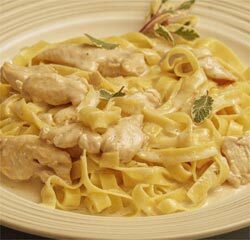 You can vary the taste of this dish by the way you cook and add the chicken.The chicken breasts can be grilled and served on top of, or beside the Fettuccine Alfredo, or cut in morsels, sautéed or grilled until just done, then mixed with the fettuccine and sauce at the end. My favorite is chicken grilled on charcoal. Another variation is adding a sprinkling of Parmesan cheese and finishing in the oven. You can also (optionally) add cooked, diced red pepper. You can use fettuccine, taglietelle, mostaccioli, penne or farfalle pasta. 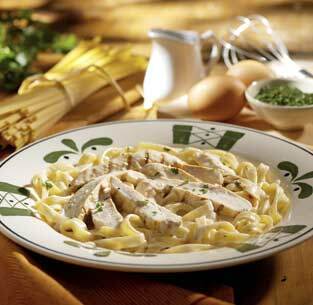 Once your chicken is cooked, you can procede with cooking the pasta and preparing the sauce at the same time. Tastes best if you combine pasta and sauce when they are just ready. 8 oz pasta (fettuccine, tagliatelle) or 12 oz (3/4 package) penne, etc. (fettuccine is heavier). OO Pasta pot; pan large enough to hold all ingredients and pasta (we use a large non-stick wok for this). SET the pasta water to boil in your pasta pot. IN the large sauté pan large enough to hold all the ingredients, sauté the chicken in 2 tablespoons of butter or good olive oil until lightly browned. Set chicken aside on a warm plate. Remember to reserve some of the cooking water to moisten your chicken Alfredo if it is too dry. IN the sauté pan: ADD the heavy cream, 2 tablespoons of butter and 1/2 cup Parmesan cheese to the same pan. Keep cooking on low-medium heat, stirring occasionally until the mixture reduces slightly and thickens. ADD pinch of nutmeg, 3 - 4 leaves of sage, salt and pepper to taste. Stir. ADD the cooked chicken and optional ingredients and mix again. Taste for salt. Add a TBSP or two of the pasta cooking water if too dry. ADD the cooked and well-drained pasta to the sauce. Mix well with a wooden spoon. TURN into a warmed serving bowl, or directly onto warmed plates. Turn pasta mixture into a baking dish, sprinkle 1/2 cup Parmesan cheese on top, and set under broiler for about 30 seconds, until flecked with brown. PASS grated Parmesan at the table. 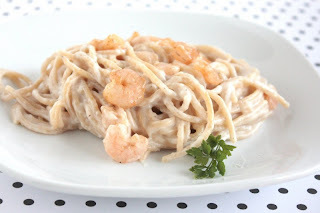 Instead of buying a jar of Alfredo sauce, make it from scratch with this simple recipe. The garlic aroma will call your family to the table. Cook fettuccine according to package directions. Meanwhile, in a large saucepan, melt butter over medium heat. Stir in cream. Bring to a gentle boil. Reduce heat; simmer, uncovered, for 3 minutes, stirring constantly. Add the shrimp, cheese, garlic and pepper; cook and stir until heated through. 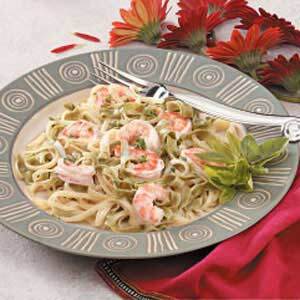 Drain fettuccine; toss with shrimp mixture. Sprinkle with parsley. Yield: 4 servings. Pulverize raw cashews in the food processor until very fine. Add 1 1/2 cups boiling water. (*The BEST way to do this, is to make the sauce while the pasta cooks - scoop out 1 1/2 cups of lightly salted pasta-cooking water and use it - the starch from the pasta-cooking water thickens the sauce PERFECTLY!) Add water to cashews and process until smooth... this will take several minutes. Add nutritional yeast (optional - my kids prefer it without), garlic clove, olive oil and squeeze of lemon juice. Process again until smooth, another couple minutes, it'll start to thicken a bit too! 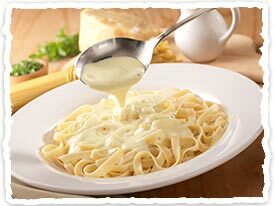 Makes a decadently creamy sauce. Serve over cooked pasta. This stuff is wonderfully simple and tastes SO very good. 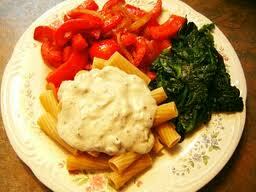 I often add sauteed mushrooms, chives, chopped olives or sundried tomatoes, depending on my mood. Heat butter in heavy sauce pan over medium-low heat. Sautee onion and garlic until onion is translucent. Add flour and stir constantly for 20-30 seconds. Slowly add skim milk. Wisk if lumps develop. Reduce heat so it doesn't simmer. Add herbs. Slowly at cheese. 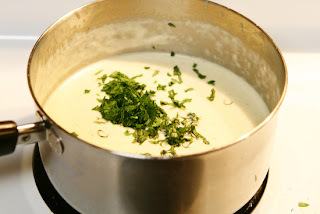 When cheese is melted, simmer for a few seconds to thicken then remove from heat. When sauce has slightly cooled, stir in sour cream. (if you do use the non-fat, I suggest letting it get almost to room temperature before adding. It breakes up easier than the regular sour cream. Also, the strained yogurt would probably hold up well.) Toss with your favorite pasta. Add butter to saucepan and melt over low heat. Add cream cheese and mash up lumps. Add parmesan and stir. Add half and half and continue stirring. Add garlic powder, nutmeg and some pepper and continue stirring over low-med heat until thoroughly heated. Serve over hot fettucine noodles with your choice of toppings. We usually grill chicken and red peppers (they are wonderful grilled and cut into strips with this) and add some steamed brocolli. The parmesan cheese sometimes appears not to completely melt and makes the sauce look lumpy...it's really not and once you put this over hot noodles it melts further and is not a texture issue at all. I also served some garlic bread sticks in little weathered tin pails from Decorator's Friend. The pails do not say food safe so I lined them with aluminum foil so no food would touch. I got so many compliments on the bread served this way! Looks cute as can be! I used store bought bread sticks and generously brushed butter on both sides, sprinkled with garlic and a spice mixture called Kicken Chicken. Normally I'd have sprinkled a little dried parsley for color but didn't have any...the Kicken Chicken was really yummy! I think you can buy it at any grocery store. I also got these green tin cones from Decorator's Friend. I used them in my birdcage tablescape last night and got so many compliments on them that I used them again for my napkins. They look really pretty with my olive green transferware. This ranuculus flower came permanently set in an old fashioned milk bottle...I got a set of six, each in different colors and they look so real. My Mom and Mother in law both had to give it a feel to see if it was real! I thought they were so pretty! Lightly brush 1 chicken breast for each serving with olive oil and season to your taste( salt and pepper, nothing, season salt, grill seasoning). Grill chicken breast until done. Set aside until cool enough to handle, and then slice each breast into 1/2- 3/4 inch strips. Cook and drain pasta of choice. 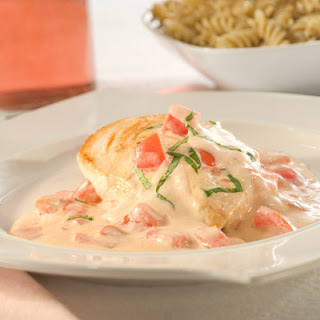 Toss pasta with sauce and top with slice chicken breasts (1 breast per serving). "This is a quick and easy side dish, that my family loves with chicken! "